Hour photo / Erik Trautmann Co owners Bob Kunkel and Ernie Marsan have renovated the old Market Basket building on Cove Ave and opened as Harbor Harvest on Friday specializing in fresh local products. NORWALKâ€ˆ– At the site of the decades-old East Norwalk neighborhood market on Cove Avenue, the much anticipated opening of Harbor Harvest has brought fresh farm-to-market, locally sourced foods to the area. 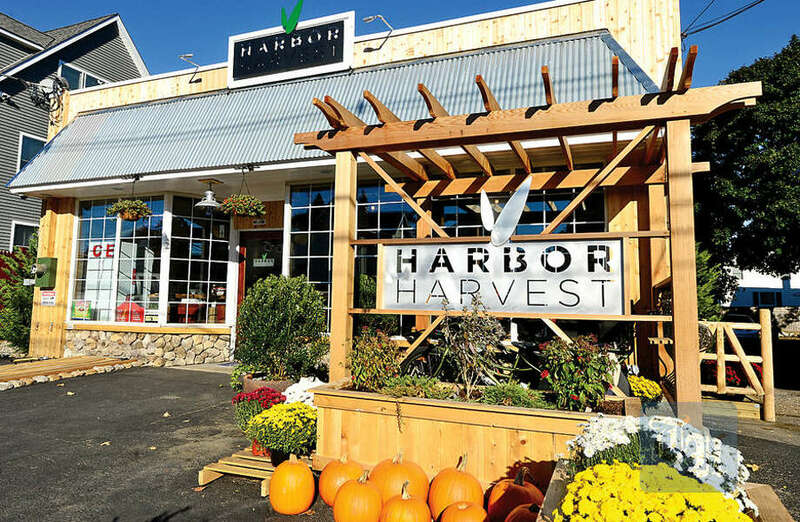 Harbor Harvest owners Bob Kunkel and Ernie Marsan have rendered a former old-time market virtually unrecognizable by transforming the space into an open and inviting market that features fresh produce, dairy and meats from farms and vendors throughout Connecticut and New York. The market’s fresh meats for example, have been hand-picked by Marsan and Kunkel as they travel to farms to select the steer and pigs that are butchered in-house. Seafood is from Alaska and Gloucester, and produce is harvested from farms in Long Island and Connecticut. In keeping with the green technology of Harbor Harvest, there is an urban cultivator on-site in which herbs are grown hydroponically. “We are able to grow herbs here that we can harvest and use in our kitchen as well as sell to local chefs,” Marsan said. The urban cultivator is the first to be used commercially in Connecticut, Kunkel said. Marsan and Kunkel plan to incorporate green technology into their business model. Before long the grocery will employ electric bicycles for deliveries. “The plan will be to be able make deliveries on these lithium powered bikes,” Kunkel said. An ambitious green initiative- an electric boat for trading voyages to Long Island is planned for the future. Kunkel, is president of Amtech, the company that built R/V Spirit of the Sound, the Norwalk Maritime Aquarium’s lithium-powered research vessel and hopes to eventually construct a boat that will move farm produce between Connecticut and Long Island. Harbor Harvest, 7 Cove Ave., Norwalk is open from 8 a.m. to 8 p.m. weekdays, 8 a.m. to 6 p.m., Saturdays, and 9 a.m. to 3 p.m. on Sundays.